Linfield were left frustrated as in-form Dungannon held out for a point at Windsor Park. The Blues led through Mark Haughey’s first half header. But Dungannon more than played their part in a competitive goal, claiming a deserved point through Kris Lowe’s 51st minute equaliser. The main threat in the early stages came from set pieces. First Dungannon’s Douglas Wilson tried his luck from the edge of the box, but his left-foot effort flashed narrowly off target. Sammy Clingan twice went close for Linfield, thumping the first into the wall, before sending the second just over. Aaron Burns worked the goalkeeper after taking a pass and aiming across goal, but Andy Coleman got down well to block his left-foot attempt. 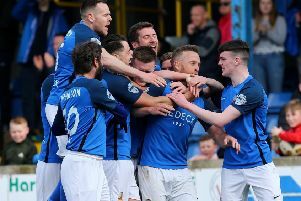 The deadlock was broken in the 37th minute as Linfield punished some slack Swifts marking. No-one had picked up Haughey, and the defender rose to head home from Josh Carson’s corner. However, Dungannon responded well, with goalkeeper Roy Carroll pulling off a terrific stop to tip over Jamie Glackin’s powerful drive. The goal aside, the Swifts had performed well, and they drew level six minutes after the restart. Andrew Mitchell provided the assist with a terrific ball across the box, handing Lowe a tap-in at the back post. Linfield struggled to break down the Swifts, rarely threatening Coleman. Ally Teggart could have won it for Dungannon late on, cutting inside from the wing but being brilliantly denied by Carroll.